These blue cheese and fig jam appetizers are so delicious and addictive, most important they're so incredibly easy to make. If you're entertaining for the holidays, it helps to have a few appetizers you can assemble at the last minute. You can simply set out a cheese and cracker tray, but if you need a last-minute appetizer platter that looks (and tastes) amazing, try these Blue Cheese & Fig Jam appetizers. 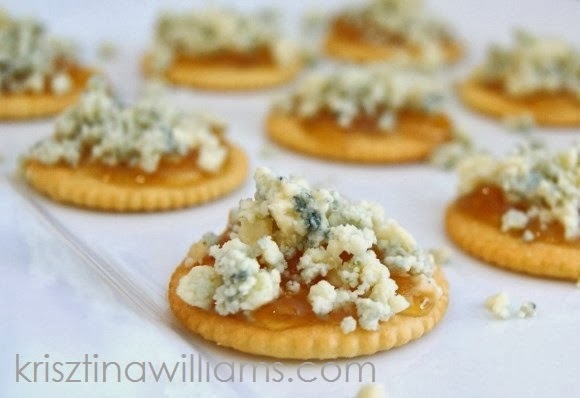 All you need are butter-round crackers, fig jam, and a small container of crumbled blue cheese. (You can use sliced blue cheese if you prefer). Either way, a small container of both the cheese and jam will go a long way, so you'll have more than enough. Take one cracker at a time and use a butter knife to spread the fig jam on first, then place the cracker on your serving platter and use a small spoon to top the jam with about a teaspoon of blue cheese. *Tip: Try variations of the same recipe using the formula of cracker + jam + cheese. Other tasty combinations I love include apple jelly with smoked gouda, raspberry jam with ricotta, and red current jam with brie. You can find more cheese pairing ideas in this jam and cheese pairing guide. I have, and this looks really tasty! Oh, you're missing out, William. Go get some blue cheese!